Actual shipping will be charged for all hymnal products. Bundled Kits to Help You Save! To help you save, we are offering bundles of resources to assist you as you make plans to adopt the hymnal or if you are operating with a small budget for worship resources. 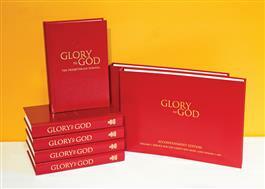 This introductory kit contains 5 copies of the pew edition, in the red Presbyterian edition, and one accompaniment edition. Bundle price: $140, a savings of $45. That's like getting two pew editions for free!